The Federal University Ndufu Alike, FUNAI Hostel Accommodation For Returning Students for the 2018/2019 academic session has commenced. 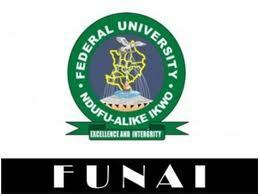 All the returning students of FUNAI who are interested in Hostel allocation have been directed to register online. Please note that the allocation of bed spaces in both male and FUNAI Female Hostel will be done on first come first served basis. Application for Federal University Ndufu-Alike Ikwo Hostel allocation will close on Monday 2nd October, 2018.